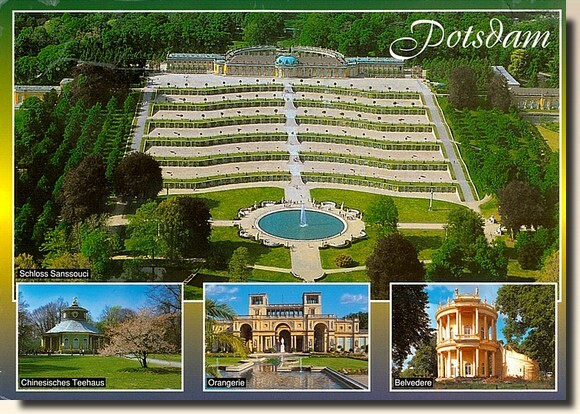 Sanssouci is the name of the former summer palace of Frederick the Great, King of Prussia, in Potsdam, near Berlin. It is often counted among the German rivals of Versailles. 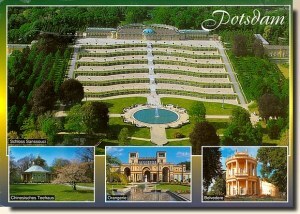 While Sanssouci is in the more intimate Rococo style and is far smaller than its French Baroque counterpart, it too is notable for the numerous temples and follies in the park. The palace was designed by Georg Wenzeslaus von Knobelsdorff between 1745 and 1747 to fulfill King Frederick's need for a private residence where he could relax away from the pomp and ceremony of the Berlin court. The palace's name emphasises this; it is a French phrase (sans souci), which translates as "without concerns", meaning "without worries" or "carefree", symbolising that the palace was a place for relaxation rather than a seat of power.